A dazzling cornucopia of color! This regional mix includes an uninhibited collection of oranges yellows, purples, and more: just the sort of inspiring hodgepodge that only nature could concoct. 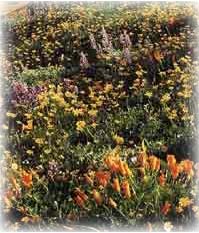 Includes Baby's Breath, California Poppy, Baby Snapdragon, Scarlet Flax, and six other varieties. Contains 100% wildflower seed, no inert material. Grows 1-2 ft tall. A literal checkerboard of color with rich reds to delicate pinks and yellows. This mix has all the colors of the rainbow!